الخيار الأفضل للحصول على المتعة والاسترخاء, Quest Echuca Serviced Apartments يقع في منطقة إيشوشا في Echuca. يقع الفندق على بعد من مركز المدينة، ويؤمن الوصول إلى أهم مراكز المدينة. بالنسبة لمن يريد الخروج، هذه بعض المعالم السياحية المتوفرة للزوار Echuca Farmhouse Cheese, Echuca Heritage Sweet Co, ‪Port of Echuca Discovery Centre‬. إن الخدمات التي يقدمها Quest Echuca Serviced Apartments تضمن للنزلاء إقامة مريحة. إن واي فاي مجاني في جميع الغرف, مرافق مخصصة لذوي الاحتياجات الخاصة, واي فاي في المناطق العامة, صف السيارات, خدمة الغرف هي جزء فقط من الخدمات التي تميز Quest Echuca Serviced Apartments عن باقي الفنادق في المدينة. يمكن للنزلاء الاختيار من ضمن مجموعة من الغرف المصممة بعناية لتعكس جواً من الراحة، والتي يتجاوز عددها 60. إن حمام سباحة خارجي هو المكان الأمثل في الفندق للاسترخاء وتفريغ طاقتك بعد نهار طويل. مهما كانت دواعي سفرك فإن Quest Echuca Serviced Apartments هو خيار ممتاز لإقامتك في Echuca. Clen and decent sized rooms right in the middle of town. Thanks Dean, we're glad you enjoyed your stay in our central location. Great apartment and location. Pool a bonus. Good Size Room, Comfortable Bed and Great location. We had a good stay at the Quest apartments. As a chain there is a fairly good level of service and standard amenities. The 2 br we purchased was actually a 1 br with a studio room adjoined. The 1 br is a little bit pokey as compared to some competitors. Not sure it's a proper four star hotel either. But everything was clean and comfortable enough. I don't think the hotel has any food options, but there's plenty of places within 5-10 mins walk and the location is ideal if you want to be in the middle of Echuca. we had an enjoyable stay, everything was good; room cleanliness, location was excellent as it was right in the centre of the town; easy to find. We enjoyed our stay very much. The rooms were well set out, roomy and clean. The staff friendly and helpfull. 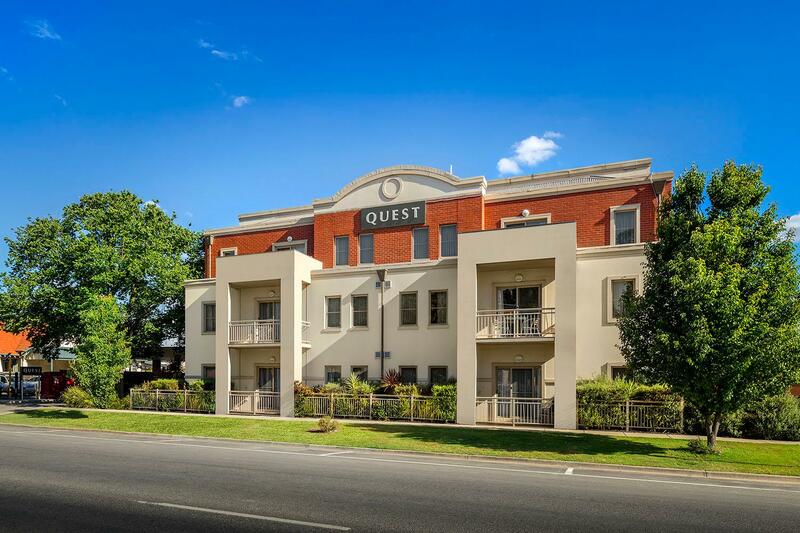 I would recommend anybody to stay at Quest Echuca. The location is within walking distance to the Port of Echuca, the bridge over to Moama and a few restaurants and hotels. Kitchen was well equiped. Selection of tea and coffee available in the room. At first glance the apartment looked nice, but the sofa (sofa bed) was saggy and uncomfortable. There is a window (cloudy glass) in the wall between the lounge room and bedroom so light and sound from the lounge room disturbs anyone in the bedroom. The king bed was old and lumpy and needs replacing but the linens were clean and in good order. There is no soundproofing so you hear everything going on in the hallway and neighbouring apartments. We could hear people using the toilet while we were waiting for the lift! The smoke alarm went off at 9am, apparently caused by the people in the next apartment cooking toast. There is no food available, but there are plenty of pubs and cafes nearby. The staff were friendly but I wouldn't stay there again because there are much better options available in Echuca/Moama for the price we paid.